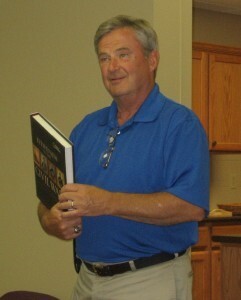 Dr. Larry Chamberlain was honored on June 12 for his service to the Grace Brethren Investment Foundation. On June 12, 2012, Dr. Larry N. Chamberlain was honored by the staff of the Grace Brethren Investment Foundation (GBIF) with a luncheon for his tenure of 35 years serving the Foundation, along with the former Grace Brethren North American Missions, Inc., and Grace American Indian Ministries, Inc. Since 1977, Larry has held a number of positions within these organizations, and has provided a lifetime of service and generosity to the Fellowship of Grace Brethren Churches (FGBC). Hallmarks of Larry’s tenure include his leadership in church planting, including expanding into Canada; steady management of the GBIF, the lending arm of the FGBC; the development of the Retirement Investment Plan; and oversight of the Eagle Commission. Special tributes from some of the former administration and staff were read to him during the event, including Kurt Miller, Bill Snell, Jim Johnson, Steve Galegor, and Jesse Deloe. Current staff and spouses enjoyed reminiscing over the years of working alongside Larry and recounting and benefiting from his excellence in leadership. Congratulations Dr. Chamberlain. You are a faithful servant and a good friend. You bring comfort to many knowing that under your watch, there has been much fruitfulness in the ministry for Jesus. Thanks for your example and keep up the ministry--no time to let up! Hey Larry, so sorry we could not be a part of your celebration. We heard it was a beautiful encouragement and honor for you and the ministries that you have led so efficiently, faithfully and with the utmost integrity. Looking forward to the years ahead and all God has in store for you and praying to always be connected by our hearts.